This couple was a vision in purple for their country club wedding in Upstate South Carolina! Woven in among the beautiful violet and lilac details were dragon accents that the couple holds near and dear to their heart. For this Holly Tree Country Club affair, Dani and Sam called on photographer extraordinaire Jessica Hunt to capture their day. "it was also such an honor for me to photograph because before Dani and Sam were my clients, they were my friends!" says Jessica. "This beautiful Greenville, South Carolina wedding was perfect in every way"
While dragons might not be a traditional symbol of love, Dani and Sam have embraced them as a part of their love story. Dani explains: "Long before my husband and I started dating, I had a dream that I was being chased by some unknown evil. Sam (my then best friend and now my husband) took the form of a giant, beautiful, blue dragon; he fought the evil away, and I flew away on his back. Every since, I've called him my dragon." That mystical, magical creature influenced many parts of their wedding from a blue dragon ring Sam gave Dani and their toasting flutes. The wedding dress even had a dragon tie-in! States the bride, "The caplet on my dress was inspired by the Dragon Queen from Game of Thrones (who also happens to be named Dany, just with a 'Y' instead of an 'I')." It's not easy finding the perfect gown to showcase your personality on your wedding day. You've got to find something that's flattering, on budget, and is appropriate for your venue. For bride Dani, her wedding dress experience was an eye-opening experience (in a good way!) thanks to her mom. She remembers, "My dress marked a beautiful turning point in my relationship with my mom. As with many girls, throughout my childhood and teenage years, I never liked the clothes mom picked out for me. I hadn't even gone dress shopping yet when mom sent me a picture of my dress in the window of a local boutique, and I fell in LOVE." Once she realized that her dress was the one she'd been looking for, it was time for Dani to make one more choice. "I never really liked traditional veils and wanted an alternative," she says. "So instead of a veil, I got a caplet inspired by the Mother of Dragons from Game of Thrones." Dani and Sam both attended Clemson University, and, thanks to their overlapping friend groups, found themselves at the same parties and gatherings. States Dani, "We slowly became best friends and remained so for a very long time." As the two grew closer, they both began to realize how much they meant to one another. Yet, remembers the bride, "The timing just never worked out, and we never admitted to each other how we felt." Until one fateful day, when Dani returned home from a date and went to talk to Sam. Seeing her go out with someone else gave Sam the courage to speak up finally. "He told me how pained he was to let me go and admitted how he felt!" she says, and quickly returned the sentiment. For their proposal, Sam recreated their first date: they ate barbecue at their favorite spot, and strolled around campus talking about their favorite memories at Clemson. They then took a walk through the Botanical Gardens. Dani was caught off guard: "There's one particularly beautiful area in the gardens, and every time we've ever hiked there, Sam has talked about how that spot would make for the perfect proposal. 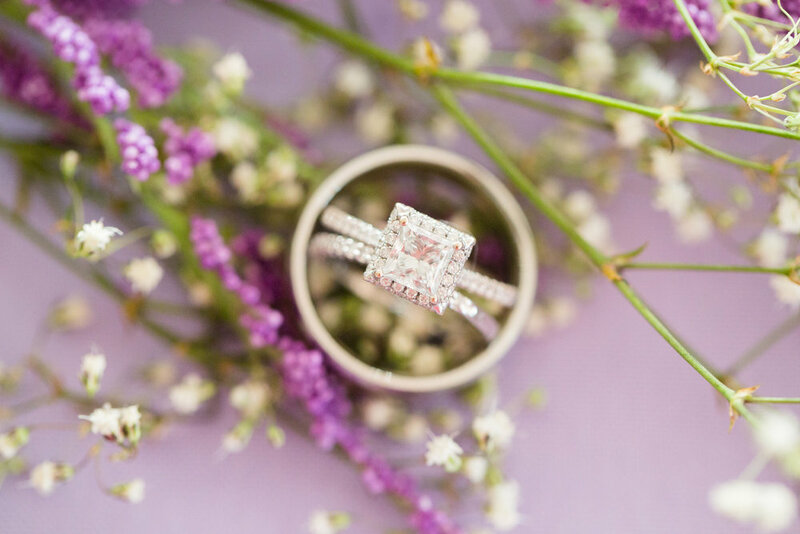 When he got down on his knee, I almost didn't believe him until I saw the ring!" "Don't try to tackle it all at once! It will overwhelm you. Make weekly goals and focus on ONLY those goals that week. Also, no matter how picky you are, don't be afraid to ask your fiance for help. Just be direct and specific. They will likely appreciate your instruction so that they can feel useful."